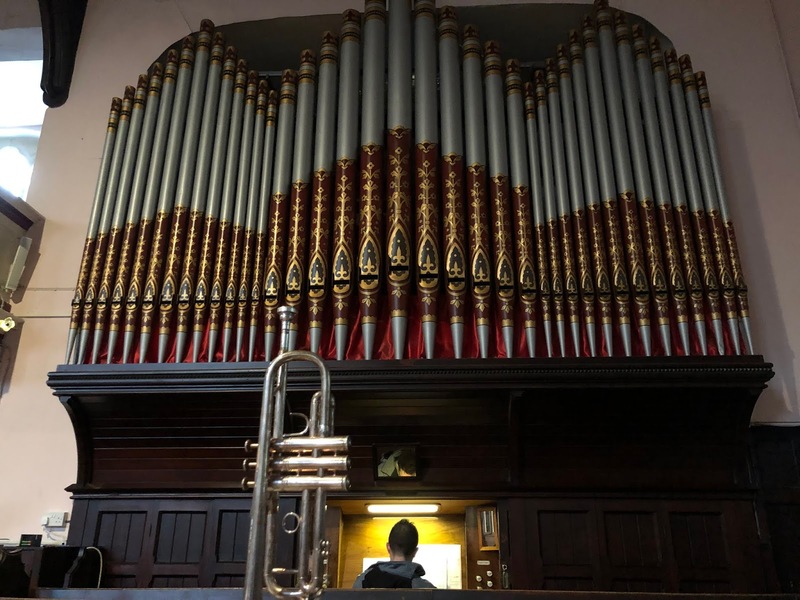 Inspired by the Medieval manuscript the Chronicles of Mann, two Manx-born musicians Russell Gilmour (trumpet) and David Kilgallon (organ) performed in the duo ‘Chronicles’ at St. Paul’s Church in Ramsey on the Isle of Man on Friday 28th December 2018. The Chronicles of Mann mentions various locations including: the Isle of Man, Wales, Scotland, Ireland and even places as far away as Norway and Brittany. The duo’s programme explored traditional music from these countries in a variety of styles, instrumentations, moods and timbres. The duo performed compositions, improvisations, re-imagined complete works and self-arranged suites of music from key locations mentioned in the Chronicles of Mann and from around the Seven Kingdoms said to be visible from the summit of Snaefell, the highest peak on the Isle of Man. The duo began their performance for the Ramsey Music Society with a set of three tunes, the first from Sweden, the second from Cornwall and the last from Sweden. The Cornish tune in the middle (played on a Renaissance cornetto) is called Constantine and is named after a famous beach near Falmouth. The tune has become one of the most iconic Cornish tunes. It seemed appropriate to start with this arrangement of music from both Scandinavian and Celtic nations, the regions often mentioned in Chronicon Regum Manniæ et Insularum, or as we know it: the Chronicles of Mann. For Ottar! For Ottar! Our faltering ranks reply. O sisters! O sisters! For lord and lover, sire and son. Now arm, now arm we for the field. Now arm we everyone! What allies, what allies troop hither to our aid. O wonder, our women beside you death disdaining stand. Now hew, now hew, the spoilers down, let none escape your hand. Macmarus, Macmarus, and all his chiefs are slain. For brave women's glory blown while love and valour last. Taking the Chronicles as inspiration, Dave Kilgallon and Russell Gilmour had adopted a tune called 'Når månen tindrar' played by the Norwegian group ‘Firil’ on their 2013 album 'Smile som sumarsole' - meaning 'Smile like summer sun'. 'Når månen tindrar' means 'the moon sparkles' and the duo has arranged this tune in a modern style, which they hoped would give a sense of the vastness of space. Learn from thee luxurious fasting. From England, the focus moved over the Irish Sea to Ireland to enjoy three polkas composed by a young folk musician and multi-instrumentalist, Eoghan Ó Ceannabháin. Dave and Russell explained that they had enjoyed listening to Eoghan play these at the Festival Interceltique in Lorient. Having listened to the tunes of his Fatai Nite Polkas, we asked him what the polkas were called, he replied simply: "potatoes". Chronicles had mixed the tunes together differently, changing the order and format drastically from the original they remembered - they suggested that they could perhaps call this set mashed potatoes! The group mentioned earlier the Festival Interceltique in Lorient in Brittany, which is where the story of the Chronicles duo began. David invited Russell to play in the Cathedral in Lorient, replacing a bombarde player who had become unavailable. (The bombarde is a type of double reed woodwind instrument, part of the shawm family, which is traditionally used in Celtic music in Brittany.) Bombarde and organ then became trumpet and organ and we continued playing together after the Lorient festival. The rest, as they say, is... Chronicles! The duo began the second half of the concert with another of David Kilgallon's commissions for the Manx Heritage Foundation, which is also available online at www.manxmusic.com. The duo had transposed this piece from the original key and added a trumpet part to enhance an already very celebratory march. Chronicles felt it would make a good wedding march, like the famous Prince of Denmark's March or Stanley Trumpet Voluntary. The next few pieces in the programme represented music from some of the Kingdoms visible from the top of the Snaefell mountain. They begin with a version of the hornpipe "Rose in the Gap", which they had first heard on the 2006 album “Tripswitch” by John McSherry & Dónal O'Connor. Dónal O'Connor is an Irish folk musician, producer and television presenter from Ravensdale in Ireland. His father Gerry O' Connor was a renowned fiddle player from Dundalk, who seems to have written this tune. Gerry's background in step dancing is clear in this style of dance music - for which he is noted. He is regarded as one of the great fiddle players of his generation. Gerry's mother (Donal's grandmother) was also a renowned fiddle player and and long-serving fiddle teacher: Rose O'Connor (née O’Brien) - and it is possible (though not confirmed) that the 'Rose' in the title refers to her." The next tune in the programme was from James Oswald's Caledonian Pocket Companion of 1751 . Russell chose to arrange this piece for the 80th Anniversary of Onchan Silver Band in 2017. The band had commissioned seven composers to write seven pieces to create “The Seven Kingdoms” suite, which was performed on the Isle of Man Steam Packet Company's ‘Ben-My-Chree’ on 24th June 2017. 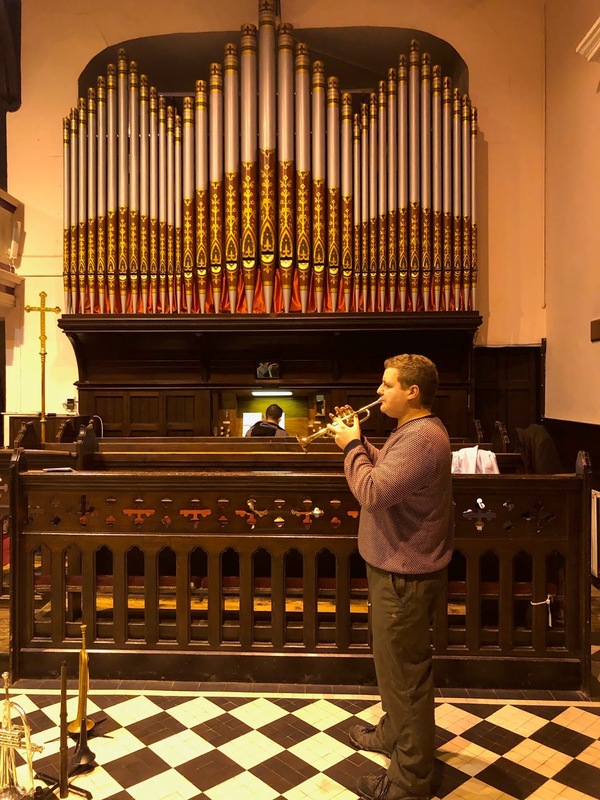 Russell explained that Chronicles had to take a smaller format when an organ was unavailable, so David played the fiddle with Russell playing the trumpet for this rendition of ‘The Highland Lamentation’. Moving from Scotland to Wales, Chronicles presented a dance tune by the name of Sawdl y Fuwch. The title translates as 'cowslip', the plant. It's normally a fast dance tune, but the duo turned it into a dramatic piece for trumpet and organ in a pseudo-baroque style. Returning closer to home, David Kilgallon played the Manx tune 'Graih Foalsey’, meaning false love. Excellent versions of this can be found on recent albums by Barrule, Ruth Keggin and Mera Royle, among others. For this tune, David played the tune on the fiddle and Russell accompanied him on the organ. David explained that Russell liked to try playing the organs wherever they play. The spoken introduction from David Kilgallon featured a few humorous interruptions by Russell, playing snippets from Joplin’s ‘The Entertainer’ and Bach’s ‘Toccata and Fugue’! Continuing the tour of the Seven Kingdoms, the duo played a set of three pieces which they called the Sun Set: the first tune was by a Manx composer, Bob Carswell. His beautiful tune is called Irree Ny Greinney, which translates as ‘The Rising Sun'. Next came a Scottish tune, 'Gruagach Bhàn a’ Mhìn-fhuilt' which translates as 'The Girl with the Flaxen Hair', from there they merged the Scottish tune with a well-known signal call called a 'Sunset' or a 'Retreat' - a fanfare that was played in military ceremonies as the flag was lowered for the evening. It was played on an original cavalry trumpet from 1902, and Russell told a humorous story about its previous owner, Cripsian Steele-Perkins, who had taken a trumpet with a valuable and antique banner onto the Antiques Roadshow… when he was interviewed, they asked about his trumpet playing and where he had played in the past. He had recorded their theme tune! Sticking with the Seven Kingdom theme, the duo explained that the final Last Post-style sunset represented England (or Britain in general) and, with 2018 marking the centenary of the armistice of the First World War, they attributed the military sunset to the Kingdom of Heaven, dedicating the piece to the memory of those who were involved in that conflict that ended a century ago. To continue with the theme of the Seven Kingdoms, the duo moved onto the Kingdom of the Sea, in which they used the well-known Manx folk tune 'Three Little Boats’. They presented it in a pastiche, imitating Vaughan William's iconic, musical style. It began and ended with improvised modal melodies. Having completed their Seven Kingdoms theme the duo moved onto more festive matters - Chronicles at Christmas. They combined the well-known Manx tune Ny Kirree fo Niaghtey (The Sheep under the Snow) with the originally-Cornish Sans Day Carol. The tunes have the same word structure, so theoretically one could sing the words of one to the words of the other. This was the duo's first outing of this piece! The duo gave a vote of thanks to everybody for coming to the concert and they also thanked Ramsey Music Society and those at St. Paul’s Church in Ramsey. The performance was very well-attended, with around 80 persons present. Finally, the duo had saved their favourite set until last - a set of three Manx traditional tunes. The first tune Berree Dhone features an E minor triad in three different inversions, which the duo hoped might show that whichever way you throw it, it will stand! Reeaghyn dty Vannin had a suitably Chronicles-esque regal theme and Mylecharaine’s March is inextricably linked to the Manx National Anthem. After a vote of thanks from Ramsey Music Society the duo played an ad-hoc encore, featuring the final movement of the Purcell - Your hay it is mow’d’, which segued into renditions of the Sussex Carol and the Pogues’ Fairy Tale of New York, before returning to the original tune! David Kilgallon and Russell Gilmour performed in the Eglise Saint Louis concert within the Festival Interceltique de Lorient 2015. We played first in the concert this year (as I had to go to the Stadium for the Nuit Interceltique at 10pm) and we began with a performance of ‘Mannin Vooar’, which we have adapted for Trumpet and Organ from David’s original solo organ arrangement/composition. Next followed a progressive interpretation of the Norwegian song ’Når månen tindrar’, and then we played a suite of complicated and fast-moving Irish tunes by Eoghan O’Cannabain. We finished as we began - with a Manx tune - and we played the two tunes that we deemed to be the unofficial ‘anthems’ of the Manx contingent at FIL - Irree ny Greiney (by Bob Carswell) and Mylecharaine's March. 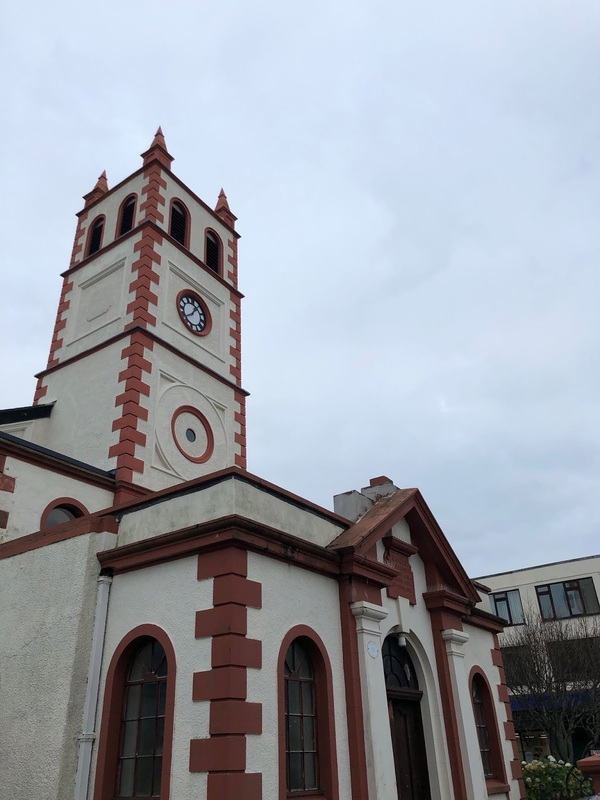 On Wednesday 5th of June at 19:30, Russell Gilmour and David Kilgallon will be performing lively and traditional celtic music for trumpet and organ in St. Thomas' Church in Douglas. Admission is free, and there will be an opportunity to sponsor our upcoming CD recording project upon exit. A great way for visitors to the Island to hear some of our musical heritage!